A SPIRITUAL GIFT OR A MENTAL DISORDER? THE MENTAL DECODER IN SHORT CIRCUIT. Interlocutor: ... Moving on to the next question, what is the "gift of tongues”? Ruanel: The gift of tongues has to do with past lives, it has nothing to do with telepathic communications. It has already been said numerous times that in telepathic communications the decoder of the medium translates concepts or ideas to his language. When there is a gift of tongues or something like that, what happens is that the decoder has suddenly a temporary blockage, it makes a click and it is connected with several past lives that come one after another in that instant in a disordered way to the mind. Interlocutor: Could it be something like a radio that suddenly is out of tune and it tunes several radio stations randomly at the same time, where one speaks Spanish, and others English and German? I say it because at some time I have seen that kind of event in a radio that was damaged. Ruanel: Yes, the example is a little bit coarse, but it is valid because it gives the idea of what happens when the “gift of tongues” takes place. The difference is that if one records what one hears of the not well tuned radio, later on he can determine, listening the tape several times, what it is saying. But if what the person says is recorded in the moment that the gift of tongues takes place, and one listens carefully the recording, one will be able to realize that what has been said is not a language and it’s unintelligible. Interlocutor: Isn’t a language then? Ruanel: Correct. The decoder in the case or the gift of languages is in short circuit. Interlocutor: Master, here I have scheduled a question that people have asked me and I didn’t remember the answer. I say I didn't remember because I thought that this topic was already approached. Can the 10% spirit remember past lives, or it is only through the 90% he remembers them? The question is related to the "gift of tongues", that is to say, How was possible that the 10% recalled all the past lives that came one after another confusedly with those languages, if we don't have reincarnative memory. Ruanel: The 10% can also remember past lives for the simple reason that the 10% and the 90% are the same spirit. They are not two spirits. The problem is that the 10% is so imbued in a world that is full of noises, scents, full with diverse things. It is as if you suddenly went to another country. Each region has a different scent. A spirit that embodies in the physical plane suddenly is in a world of noises. For that reason that spirit adapts to the noises, the fetus is wrapped up almost in silence; the noises are also listened through the mother's uterus, but they are more attenuated. Interlocutor: I understand, but how is the dysfunction called the gift of tongues produced in fact? Ruanel: Most of the cases called "gift of tongues" are frauds. There are Protestant texts, for example, where they relate cases when that person is attacked by a demon, he falls to the floor and he starts speaking supposedly unknown languages. But in fact they don't speak in any language at all, but rather they babble guttural sounds. These cases don't have nothing to do with past lives, simply the decoder entered in short circuit. What the demon really does, and this is scoop, is to manage energies in the same way the spirit does. Interlocutor: Are we are speaking of "demons" or spirits of Error? Ruanel: We are speaking of demons. Demons do something that the spirits of the Error don't do, since the spirits of the error, after all, take care of themselves. Demons, on the other hand, make focus, energetically speaking, and the place where they choose to make focus is the decoder, the cerebral cortex. What happens then?... How do the neurons work? Interlocutor: I don't really know. Ruanel: The neurons work, that is to say, they decode through electric impulses... What would happen if they increased those electric impulses? Interlocutor: Obviously they would enter in short circuit. Ruanel: Sure! Cases of epilepsy, convulsions, etc. Take place in this way. This is what demons do. 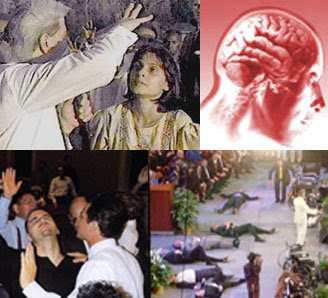 For that reason in evangelical temples, in Catholic charismatic churches, suddenly some of the parishioners begin having convulsions, they fall to the floor spitting foam through their mouths because they are attacked by demons who produce in them short circuits in the cerebral cortex. Interlocutor: This is the first time I hear this. Ruanel: Of course. It is a scoop. These people, then suffer convulsions, they fall to the floor, they lose the notion of reality and they show paranoid behaviors, it is simply because of the short circuit produced in the cerebral cortex. Interlocutor: Do these things only happen to predisposed people? Ruanel: Obviously, since not even the strongest demon can act against the divine free will that all beings have. Interlocutor: There is a famous case called "The children of Illfurt" that happened in the XIX century, in the year 1864, well documented, in a small village of Alsace, Illfurt, where two small children, of 7 and 9 years old, began to have strange visions and somehow they entered in an altered state. Although at times their behavior was normal, suddenly they were upset, they began to scream, to laugh, to gesticulate and their voices changed, they were raucous, broken, like adult voices, their bellies were swollen and they complained they have a bug in their stomachs. Is Its source something also similar? Ruanel: Of course! These boys, somehow, had given "permission" so that these negative entities acted, and these entities provoked in them short circuits in their decoders. Interlocutor: The dysfunction called gift of tongues, when it has connection with past lives, Does it take place through the 10% or is the 90% that transmits it to the 10%? Ruanel: It takes place through the 10% by means of an erroneous regression, because the 90% would never transmit to its own 10% something like that. He would not make him suffer in that way because definitely, it would rebound in him. Don't forget that the 10% and the 90% are always the same spirit. Interlocutor: In Dianetic audition which technique we know, we can arrive to past lives, Is the 10% the one that returns or the 90%? Ruanel: Actually it can be both ways, It depends of how the person who is audited is. Usually, at audition level, the one that goes to past lives is the 10%. Because he is the person who is in analytic condition. When the person is analytic, he is generally, as one commonly would say, "with his feet on the ground", then he doesn't communicate with his Higher self. For that reason the one that goes back through time is the 10%. With other techniques of regression, for example the light sofrosis of which we have spoken already in other session, he already enters in a more altered condition of conscience and then he communicates with his 90% and the 90% takes the 10% him by the hand, to say it in an illustrative way, to past lives. But I repeat not Dianetic Audition, because the person is totally analytic and, therefore, with his feet on the ground and not in the sky. Interlocutor: In the process of Auditions of Scientology, where the E-meter is used, Is the 10% also audited? Ruanel: Yes, it is to the 10%. Don't forget that the one that has engrams is the 10%. Besides, all the feelings can only be felt at skin level. By common sense you have to realize that audition is to the 10%. He is the one that perspires when lying, the one that looks away when he is saying something mistaken. Interlocutor: In Dianetic audition, or Scientology, Can the Thetan or 90% help to his 10%? Ruanel: Of course he can help, and he helps if the appropriate conditions are given. This entry was posted at Saturday, June 13, 2009 and is filed under Biblical mysteries . You can follow any responses to this entry through the .